But when will JLR deliver a better infotainment system? 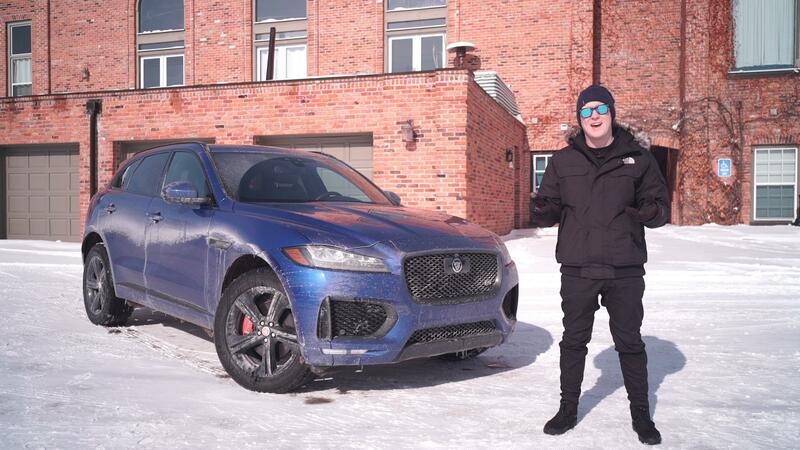 The following is the transcript from our above 2018 Jaguar E-Pace video review. To read more about this compact luxury SUV, read our E-Pace first drive review. There's nothing like some Sunday morning driving. And today I am driving the 2018 Jaguar E-Pace, which is Jaguar's latest gasoline-fueled crossover offering, not to be confused with the I-Pace, which is their electric vehicle. This particular model is powered by a 246-horsepower turbocharged, 2.0-liter, four-cylinder engine that makes 269 pound-feet of torque. It's mated to a nine-speed ZF automatic transmission, and my biggest gripe about the engine is that it can be a bit laggy, especially driving around in the mountains, particularly in Comfort mode. I would also appreciate paddle shifters on all of the models, not just the R-Dynamic, the lack of which on a $54,000, so-called sporty crossover is pretty disappointing. My disappointment doesn't linger very long, however, as the nicely weighted steering in this cub makes driving on these mountain roads pretty enjoyable. All-wheel drive does come standard on all varieties, and each feature four drive modes: Comfort, Dynamic, Eco, and then Rain/Ice/Snow. Let's talk about looks. Jaguar chief designer Ian Callum knows how to design an SUV. The F-Pace is my favorite looking vehicle in the segment and the style translates nicely to the smaller E-Pace. While it's not as good looking as its big brother, in my opinion, it definitely takes the crown over the Range Rover Evoque and the Discovery Sport, both of which share its platform. In fact, the E-Pace would rather easily be the best-looking vehicle in its class, if not for the newly-released Volvo XC40. This Cesium Blue paint is one of my favorite colors on the market, well worth the $590 price tag, in my opinion. I'm not a huge fan of chrome in general, and while this car is no exception, you can opt for the Blackout Pack, which replaces all the chrome on the car with gloss black paint. My biggest gripes with the F-Pace? Interior, infotainment and price. Those issues remain in its smaller sibling. When it comes to interiors, the Germans and the Swedes do a much better job, and when it comes to price, there are much better interiors out there. Most of the materials inside that you touch do feel pretty nice, but there are still a few cheap-feeling plastics around the cabin. And until there's a significant update to the infotainment system, JLR is always going to be behind the competition. I find my experience with this touchscreen to be the same experience I had with the touchscreen in our long-term XE and F-Pace: laggy and frustrating. When it comes to price, it is a Jaguar, so be prepared to pay. The base price of the E-Pace starts at $38,600, and the SE that I'm driving right now has an MSRP of $44,300. Add options like powered leather, heated front seats, a powered sunroof, and the 20-inch wheels, and that price quickly jumps into the mid 50s. The F-Pace has been a huge success for Jaguar, quickly becoming the brand's top-selling model, and by putting that vehicle in a smaller package, I'm sure that the E-Pace will be a hit, regardless of the high price tag.